The document, released Jan. 30, includes statistics on miles driven in automated mode and the frequency of “disengagements,” which refer to deactivations of the self-driving system due to failure or instances when the test driver must take manual control to ensure safe operation of the vehicle. Embark’s report mirrors the public data released by self-driving car developers such as Alphabet Inc.’s Waymo and General Motors’ Cruise Automation, which are legally required by the California Department of Motor Vehicles to report certain performance results. That requirement does not apply to Embark, but the company has chosen to share similar performance data voluntarily with the goal of building public confidence in its technology. For the fourth quarter of 2018, Embark reported a disengagement rate of 1,392 miles per disengagement. The company also said its test trucks logged 124,062 miles in automated mode during the 12-month period between Dec. 1, 2017, and Nov. 30, 2018. The figures are based on Embark’s operations throughout the United States, not only in California. At Embark, we believe in the value of transparent public statistics. The company’s automated trucks have been hauling freight for shippers, mostly in Arizona and California. 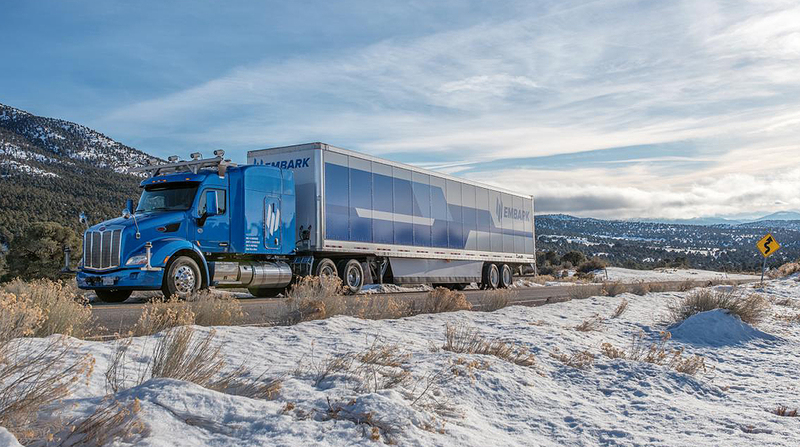 In early 2018, Embark completed a coast-to-coast trip from Los Angeles to Jacksonville, Fla., with an automated truck. Today, Embark’s self-driving trucks have commercial drivers in the cab with their hands on the wheel, actively monitoring the system’s performance and the driving environment as the vehicle travels on the highway. While that level of capability represents SAE Level 2 automation, Embark is working to develop software and hardware that will eventually enable self-driving trucks to operate at Level 4, with no driver backup, on certain longhaul interstate routes. The company envisions these Level 4 automated trucks exchanging trailers with driver-operated local trucks at transfer hubs along highways. San Francisco-based Embark has raised $47 million, including a $30 million funding round in 2018 led by venture capital firm Sequoia Capital.